With a red gradation finish that makes it identifiable at a glance, this KORG KRONOS features the new Italian-made grand piano that debuted on the KORG Grandstage. It also comes with the pre-installed "KApro Showcase" that collects only carefully selected sounds from KApro (*), who provided more than 100 of the KRONOS Sound Libraries. The gorgeous color and sound delivered only by KRONOS will make an unmistakable difference on stage. The KRONOS Special Edition is available in a lineup of three models: 61-key, 73-key, and 88-key. In recent years, this Italian grand has drawn dramatically increased attention from the worlds of classical and jazz music. The presence of its sound and its detailed resonances have captivated audiences worldwide. A full concert grand previously used in international competitions was specially adjusted and sampled for the KRONOS. This includes orchestral strings that sing with emotion, as well as brass, woodwinds, choir, and phrases. It's a showcase of sounds from KApro, who has developed more than 100 titles of Korg sound libraries. This collection will be a gateway for you to further expand your sonic variety. Kurt Ader: founder and sound designer of KARO Sound Development, recently established his own company, KApro (“Kurt Ader Productions”), in which he will continue sound design for the KORG KRONOS and also for other KORG gear in the future. Kurt has been working very closely with Prof. Dr. Peter Jung and has now begun offering high-quality sound libraries. * All specifications other than color, Italian piano, and KApro sounds are identical to the standard model of the KRONOS. When ambition, imagination, and technology converge—the results are spectacular. Witness KRONOS. Created by KORG to satisfy today’s most demanding, accomplished performers and producers—as well as tomorrow’s visionary leaders—KRONOS embodies over 50 years of artistic vision and production expertise. With nine distinct synthesis engines and a complete suite of performance and productions tools, KRONOS is simply the most versatile synthesizer ever made. KRONOS restores the magic, the thrill, and the promise that only a visionary new instrument can provide. And KRONOS delivers on that promise. Every resources and technology of service to the modern musician has been refined, perfected, and integrated into a single instrument, and is available on demand. Multiple state-of-the-art sound generation techniques represent the pinnacle of software realization. Onboard effects open the door to processing any internal or external audio source with dazzling results. Multitrack audio and MIDI recording deliver efficient studio operations in a mobile platform. Hands-on hardware includes an assignable control surface, dual joysticks, ribbon controller, top-of-the line keyboard action, and KORG’s revolutionary tap-and-drag color TouchView™ display. Best of all, KRONOS integrates all of these music-making resources into a single instrument in ways that no software setup or hardware platform can rival. KRONOS easily delivers everything you’d expect, plus many things you’ve only dreamed of. Set List mode keeps all of your custom settings and performance notes organized in the display for on-the-fly selection. Smooth Sound Transitions eliminate note and effect dropouts when switching sounds or modes. Connect virtual patch cables, select sounds, plus edit envelopes and sequences—all using the eight-inch color TouchView display. Add to that advanced sequencing, KARMA, and Drum Track composition tools. Enjoy exclusive KORG wavesequencing, MS-20 filtering and the impossibly-rich Polysix chorus. And only KORG boasts the finest sound-design team on the planet, so you can always sound your very best. The KRONOS piano engine has always offered huge collections of non-looped/natural decay stereo samples, recorded for every key, with additional unique tools to customize the piano to your needs. Inheriting all of this SGX-1 functionality, the new enhanced SGX-2 Grand Piano engine introduces the new Berlin Grand piano to the existing deep German Grand and lively Japanese Grand. The Berlin Grand offers resonant piano sound with a striking sense of depth. Other enhancements to the SGX-2 engine included Sympathetic String Resonance and newly-recorded Una Corda (soft pedal – literally “one-string”) samples. KRONOS comes equipped with thousands of sounds, created using various synthesis modes and calling upon over approximately 21 GB of preset waveform data covering a variety of genres. Each one has been carefully crafted by the KORG Sound Design team. The internal SSD offers a generous 62*GB capacity, providing enormous space for user sampling or downloading KRONOS Sound Libraries. These optional expansion KRONOS Sound Libraries add new professionally programmed sounds—without the need to add any new hardware. Artist Signature Programs provide the priceless sounds actually used by top-ranking musicians. Additional Song Programs are named for the classic rock and pop songs whose signature keyboard sounds these programs recreate. Use these universally well-known sounds to pay homage to the originals, or as the basis for personal sonic explorations. KRONOS can organize all of the resources you need to get through a song—or a set—using the Set List mode. Using the Set List mode, the TouchView display can host 16 color-coded touch-screen buttons; each one can instantly call up the appropriate Preset, Combination, or Sequence—regardless of mode! The nerve center of the KRONOS is KORG’s enormous eight-inch (800 x 600 pixel) SVGA color TouchView display. First appearing on KORG’s Karma Music Workstation in 2002, this revolutionary algorithmic music technology instantly produces sophisticated phrases, drum grooves and full-blown backing tracks. Based on the notes and chords you play—and the intuitive operations you perform with the knobs, sliders, and switches—KARMA can create musical effects that exceed anything you imagined. Now in its greatly-enhanced second generation and offering features like KARMA Wave-Sequencing, Note Mapping and 8 scenes per layer, KARMA is standard equipment on your new KRONOS. It will expand your conception of a song, and will be an enormous asset to your live performances. This function that plays drum patterns automatically was included and highly acclaimed on the M3 music workstation/synthesizer that appeared in 2007. 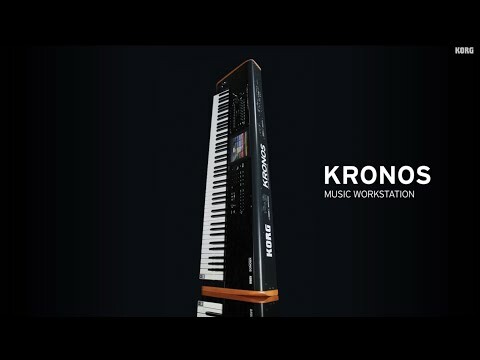 KRONOS is the latest KORG Workstation to offer the Drum Tracks features. First appearing in 2007, Drum Tracks can create everything from a simple reference beat to an outline rhythm track on up to a full-blown drum track for your music productions. Using KORG’s Open Sampling System, KRONOS can quickly sample an external audio source, regardless of whether KRONOS is in the Program, Combination, or Sequencer modes. The Open Sampling Mode can even resample the performance of the KRONOS itself. The user sample bank, which extends the convenience of the EXs sample library to user samples, allows custom samples to be loaded and played, taking advantage of the gigantic SSD capacity.